Next summer, NASA engineers will push the limits of the fuel tanks that will power the agency’s Space Launch System (SLS), the massive rocket that will take humans farther into deep space than we ever traveled. Workers at NASA's Marshall Space Flight Center in Huntsville, Alabama, have completed the construction of a critical test stand for the rocket as the agency continues preparing for its Journey to Mars. Engineers at Marshall are now installing special equipment and instrumentation for the structural Test Stand 4697. Future testing will subject the 196,000-gallon cryogenic liquid oxygen tank in the massive core stage of SLS to the tremendous forces it will endure in launch and flights to deep space. The tank of the world's most powerful rocket will be tested to the extremes before the rocket begins launching astronauts in NASA’s Orion spacecraft on deep-space missions. To accomplish these SLS tests and future testing, Marshall teams designed and will outfit the stand with sophisticated fluid transfer and pressurization systems, hydraulic and electrical control and data systems, fiber optics cables and instrumentation over the next few months. “While the SLS tank will be the first piece of hardware in the stand, this and the other new Marshall test stand can be used for a variety of vehicles and testing needs, including commercial rockets or other large spacecraft structures needed for deep space exploration,” Chartier said. 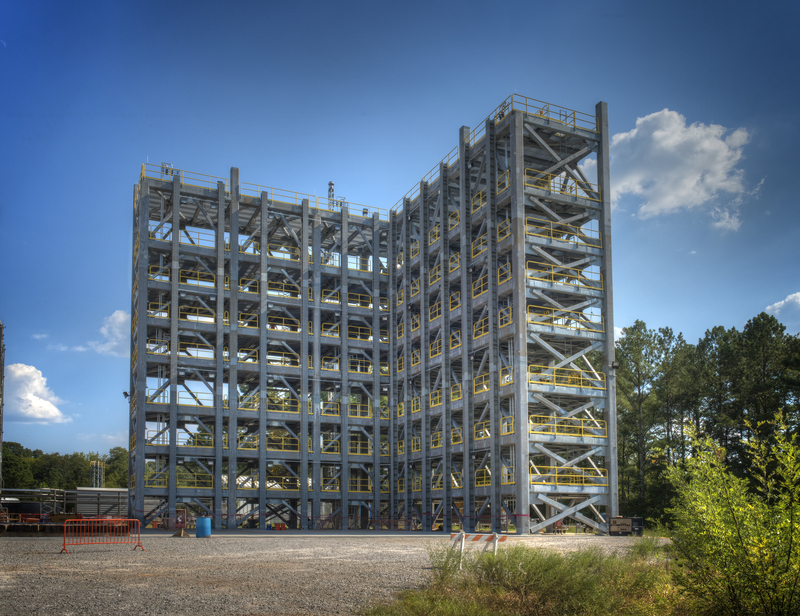 The stand's location in Marshall's West Test Area was chosen to take advantage of existing infrastructure, especially nearby storage tanks for the inert liquid nitrogen that will substitute for liquid oxygen during the series of SLS tank tests. Cross-country supply pipelines will be extended to reach the stand, along with lines for other fluids, test gases such as helium and for highly purified air. Marshall teams will also install equipment and hardware designed specifically for testing the liquid oxygen tank for the SLS core stage, which is being built at NASA's Michoud Assembly Facility in New Orleans. The test article, which includes the tank, will be produced using exactly the same materials and processes as a flight version, but with additional equipment that will simulate the tank's connections to the SLS rocket. A barge will carry the test article from Michoud to Marshall in the summer of 2017, Chartier said. Test Stand 4697 is shaped like an 85-foot-tall "L" with 90-foot-long arms. Three cage-like pedestals will be positioned in a broad circle on the foundation in the crook where the arms meet. When the 28-foot-diameter, 70-foot-tall test article arrives at the stand, it will be carefully lifted and then positioned inside the circle of pedestals -- there is only about a foot of clearance on the tank sides. The test article will sit atop a "spider" and special ring that will be bolted into the stand's foundation. A similar spider and ring will be mounted at the test article's top. It will take up to two months to install all the final sensors, gauges, systems, cameras and test equipment. In less than two minutes watch structural Test Stand 4697 rise at NASA's Marshall Space Flight Center from the start of construction in May 2014 to the end of the stand's construction phase in September 2016. The stand will subject the 196,000-gallon liquid oxygen tank of the Space Launch System's massive core stage to the same stresses and pressures it must endure at launch and in flight. Now, Marshall teams are installing sophisticated fluid transfer and pressurization systems, hydraulic controls, electrical control and data systems, fiber optics cables and special test equipment to prepare for the arrival of the test tank in 2017. When testing is underway in late summer 2017, hydraulic cylinders and "load lines" attached to the spiders' arms, the pedestals and the steel of the stand will push, pull and apply varying combinations of pressure to the tank, which will be filled with varying amounts and temperatures of fluid. Each test scenario and combination simulates a different phase of an SLS launch and flight, Chartier said. And he can hardly wait to begin. Test Stand 4697 will subject the 196,000-gallon cryogenic liquid oxygen tank in the massive core stage of NASA's Space Launch System to the tremendous forces it will endure in launch and flight. Phil Hendrix can't wait either. He's the Marshall Office of Center Operations facilities construction project manager for both Test Stand 4697 and for Test Stand 4693, where the SLS core stage's liquid hydrogen tank will be tested. The construction phase for 4693 will end later this year and engineers will begin outfitting its distinctive twin towers with its own range of special equipment. Every construction milestone feels good, Hendrix said, and everyone looks forward to the start of the tank testing -- major steps toward the first flight of a complete, uncrewed SLS rocket in 2018, on a mission that will take the Orion spacecraft beyond the moon. And major steps on a later Journey to Mars. Astronauts have a unique appreciation for the intricacies and role of testing. On a recent morning, just before landing at Huntsville International Airport, four astronauts in two NASA T-38 training jets banked low and slow over the construction crews finishing work on Test Stand 4697. It was a flyby salute from the men and women in the cockpits to the men and women on the ground whose work is vital to development of SLS -- the next great ship of human space exploration. NASA astronaut Don Pettit captured this video from the cockpit with Victor Glover as they and fellow astronauts Barry "Butch” Wilmore and Stephanie Wilson banked low over Marshall Space Flight Center at Huntsville, Alabama, saluting to teams finishing construction of Test Stand 4697. In the short video edited by Pettit, viewers fly along from the astronauts' takeoff in two NASA T-38 jets from Ellington Field Joint Reserve Base in Houston to their landing at Huntsville International Airport for meetings at Marshall. "The systems tested here will not only take humans exponentially higher and farther than these T-38’s can fly, they’ll propel explorers far out into our solar system, to places we’ve never before been able to reach,” said astronaut Barry "Butch" Wilmore, who was flying one of the jets and is the astronaut liaison to the SLS program. "We look forward to the flights of the spacecraft tanks and systems that will be tested here." Test Stands 4693 and 4697 were designed and developed by Marshall's Test Laboratory and the Office of Center Operations. The U.S. Army Corps of Engineers oversees the construction contract for the government. General contractor Brasfield & Gorrie of Birmingham, Alabama; architects Goodwin Mills and Cawood of Montgomery, Alabama; architects Merrick & Company of Greenwood Village, Colorado; steel fabricators North Alabama Fabricating Co. of Birmingham; and steel erectors LPR Construction of Loveland, Colorado expect to complete Test Stand 4693 late this year.